The MD HD2500 Heavy Duty Mobile Donor Lounge is our Newest Mobile Lounge designed for larger donors. 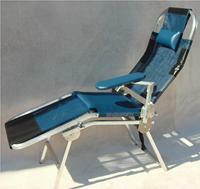 This sturdy lounge is wider than our popular standard MD2500 and can comfortly fit a donor up to 500 pounds. The standard color is BLACK and features a newly designed cart with easy locking casters that can be ordered to transport lounges. All covers are removable for cleaning, repair or replacement. Order individually (MD HD2500) or in sets of 3 with a handy carrier (MD HD2500-3). The MD HD2500-3 Mobile Donor Lounge with cart is the perfect solution to accommodate Mobile Blood Drives. The cart carries three lounges and can transport additional supplies as needed. Used Nation wide by American Red Cross and many other Blood Donation Centers, the MD2500 Mobile Donor Lounge is State of the Art in Portable Lounges. It is safe to operate, and is extremely convenient to set up and fold for storage. Both our Standard (MD 2500) and Long Leg (MD2500LL) lounges are shown in the photo above. All covers are removable for cleaning, repair or replacement. 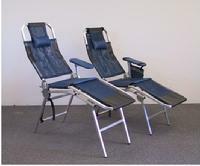 Our series of 2500 Mobile donor lounges are the perfect solution to accommodate Mobile Donor Drives. 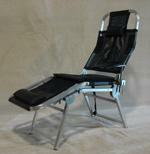 These portable, easy to set up lounges are comfortable and easy to clean. They have four positions, three of which are locking for optimum comfort and convenience. Order individually or in sets of three with carriers.